If you're cooking on a hot summer night, here's a fabulously refreshing meal to be prepared a few hours ahead of time... once you have grilled the salmon and covered with marinade, let it cool off completely. Then put it in the refrigerator for 2 to 3 hours. Serve cold, with extra marinade on the side as a vinagarette. It's absolutely delicious like this served with a cold white bean salad. 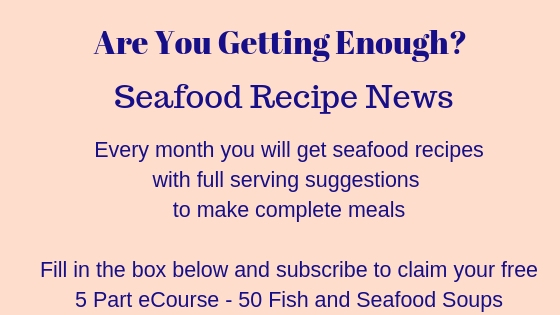 This seafood recipe was submitted by Carly from Famous French Desserts Carly's speciality is French Desserts - the clue's in the title - but she also says that she loves to cook fish. 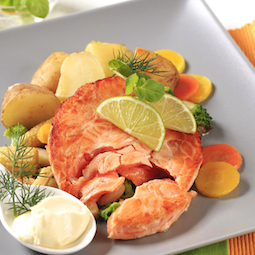 Salmon is a particular favorite as it is heart healthy and very tasty. If you marinade the salmon for a couple of hours or so before you cook, the flavors mingle beautifully. Squeeze limes. Grate lime rind from 1 lime and stir into juice. Mix in olive oil. Grate ginger and stir in. Chop coriander and stir in. Salt and pepper the marinade. 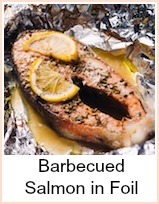 Roll salmon steaks over in marinade, cover with saran wrap, and refriderate for 1 to 2 hours. Heat up grill pan (or frying pan) on very high heat. Using paper towels wipe marinade off salmon steaks. Grill on each side for approximately 3 minutes (or to your liking). Once grilled, add 2 tsp. of marinade to top of salmon and serve immediately. How's that for a pretty easy seafood recipe?! 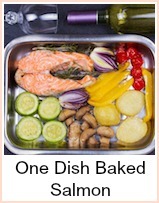 I love this recipe with salmon, but feel free to substitute with any other firm fish, such as swordfish or tuna. Are you a dessert fan? If so, take a quick look at some delicious and simple French dessert recipes at FamousFrenchDesserts. A sumptuous selection of French desserts, high-quality recipes, and step-by-step instructions. Hope you enjoy this delicious seafood recipe! And… Bon Appétit! 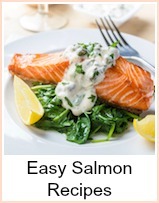 I like this recipe with salmon, but any firm fish would do. If you're looking for a recipe to use with tuna, swordfish or marlin for instance, this would be perfect. If you're cooking on a hot summer night, here's a fabulously refreshing meal to be prepared a few hours ahead of time.